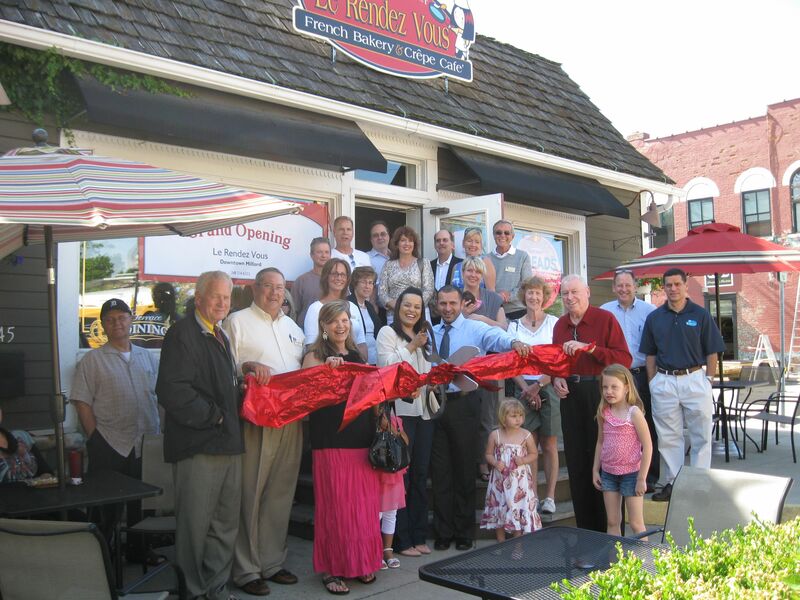 In addition to being a member of the Huron Valley Chamber of Commerce, I also participate in events and groups from the Lakes Area Chamber of Commerce (LACC), which is headquartered in Walled Lake and covers most of Commerce Township (including Walled Lake and Wolverine Lake), as well as parts of West Bloomfield Township and White Lake Township. The LACC has a referral groups program that I participate in with a group that calls itself LABAT – Lakes Area Business Action Team. I’ll admit to perhaps being drawn to the group because of a mistaken understanding of its name; however, it has proven to be a valuable referral source for business. Anyway, the LACC has an annual fund-raising event and this year it is on JUne 9th and the theme is “Rockin’ Under The Stars.” The event is an evening of good ole Rock and Roll at the Multilakes Conservation Association in Commerce – 3860 Newton Rd. The setting for this event is very Pine Knob-like – a natural grassy areana-like setting that slopes down to a beautiful lake. The band for the evening is Fifty Amp Fuse – a well-known, local rock band that puts on a fantastic show. Admission is only $10 per car at the gate. Gates open at 6:00 PM. The evening will actually kick off with a celebrity-look-alike contest. Contestants may start registering at 6 PM when the gates open and the judging will take place at 7 PM. The Fifty Amp Fuse show starts at 8 PM. Bring your own lawn chairs and enjoy the evening. Food, beer, wine and soft drink concessions will be available , but no carry-ins or coolers will be allowed. So put it on your family calendar – June 9th, 6 PM until 11 PM – Rockin’ Under the Stars with Fifty Amp Fuse at the Multilakes Conservation Association, 3860 Newton Rd. And for all of those who have friends that say you look like Shania Twain, come on out and see if the judges agree. Don’t miss it! You can quite literally go fly a kite this weekend in New Hudson, just south of Milford Township. 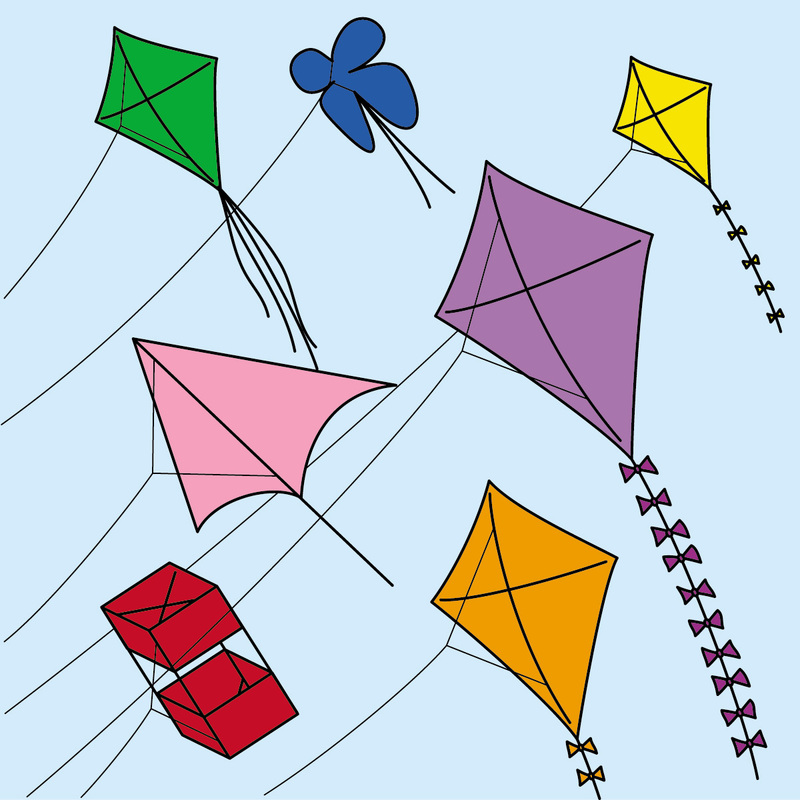 The event is the Lyon Township Kite Festival which will be held on Saturday June 2, 2012 at James F. Atchison Park, 58000 Grand River Ave, New Hudson, Michigan 48165. The festival features kite flying of all types and for all ages. Kite kits will be available to decorate and assemble for the children and to purchase for adults. A food stand with beverages will be available along with inflatable moonwalks to entertain the youngsters. The hours of the festival are 11am to 5pm. Admission to the festival and parking is free. For more information call (248) 437-2240. I think we should all go fly a kite. There’s real benefit for all of us to slow down and do something completely fun and relaxing – like flying a kite. The site of th this event in New Hudson always has a good wind for kite flying, so you won’t have to huff andf puff your way along trying to get your kite into the sky. So, go fly a kite this weekend! Memorial Day has historically kicked of the Summer season. I marched in the Memorial Day Parade yesterday and it was great, as usual – huge crowds and great weather. I also spent much of the weekend getting the flower beds weeded and the last of the flowers planted. I got my little flower bed watering system all fixed up from the hard winter and working again and I got the window air conditioners all in (a consequence of living in a house that was built in 1885 and is still heated by steam radiators). So, I’m ready to go for the summer ahead. In the real estate world we are in the prime selling season right now and local statistics show the results – more houses are selling this year than last and the inventory is down to less than 4 months worth of houses in most areas. Prices have also started to come back, but not such that sellers have recovered all the value that was lost in the recent recession – that will take years, if not a decade or more. It’s not unusual to see multiple bids on good homes right now, which again helps drive up the prices. I’m not sure which group is more frustrated right now – would be home buyers who can’t find what they want on the market or might-be sellers who are still under water on their mortgages and can’t afford to sell. Both groups find the current market unsatisfying. There is a third group of people who are also experiencing frustrations – would be renters/leasers. The lease market is even tighter that the sales market for good houses, because so many displaced families (read that foreclosed) have snapped up the lease inventory. That may start opening up a bit later in the year, because there are likely many who are about to exit their 3 years of real estate foreclosure purgatory and be in the market to buy again. In the area that I cover I’ve also noticed a good trend back to new-build housing coming onto the market. Many builders who headed for the bomb shelters a few years back are now active again and several failed or stalled developments have taken on new life. That’s a good thing. I also note that many of the builders are offering more affordable models with less frills, which is a reflection of a still fragile economic environment. I’ve just posted the sales statistics for the areas that I track on a weekly basis – Milford, Highland, White Lake, Commerce, West Bloomfield, South Lyon, Green Oak, Brighton and Hartland – on my Website MoveToMilford.com . Check them out for yourself. There is still weakness and a high rate of distressed sales – foreclosures and short sales – in a few of the markets; however, most are down to much more reasonable distress levels. The averages for cost per square foot are still low when compared to where they were a few years back, so good deals are still to be had. Combine that with historically low mortgage rates and it’s a great time to buy. So, hey, relax and enjoy the summer. Have a hot dog and a beer. Watch a baseball game. Buy a house. It’s a summer tradition! Today is the day for one of our three major parades in Milford, Michigan, and the one that my wife likes the best. She likes the Memorial Day Parade the best because it is the most honest and straightforward of all of the parades – no clowns, no politicians, no advertisements for businesses, just a parade of veterans and fly-overs by military and vintage planes. The streets of Milford are lined with thousands of people who clap for the veterans through the whole parade and say “Thank You” as they walk by. I march in this parade every year and it does give me, and I’m sure the other vets, a sence of pride in what we did; no matter whether they were in a war or just served in peacetime. The parade organizer – Joe Silva of the Milford Am Vets tries to line up the vets in chronological order, with WWI and WWII vets first, then Korea and so on, although he does let currently serving military participants go at the head of the parade. My group, the Viet Nam vets is slowly (and sadly) working it’s way towards the head of the parade as fewer and fewer WWI & II anKorean War vets survive to participate. Joe has several jeeps lined up each year to transport those no longer able to walk the parade route. The parade also features military vehicles of various sizes and types and a Scottish bagpipe marching band at the front. There are fly overs by vintage WWII planes and usually some current military jets from Selfridge airbase. The local florist passes out carnations to the children who line the parade route and they then hand them to vets as they walk by. The parade starts off at the Oldenburg VFW Post 216 on Commerce and goes down Main St ending at the War Memorial in Central Park. There is always a brief ceremony following the parade to honor those who have sacrificed their lives in service to their country. Many people who line the streets will have framed pictures of loved ones who have passed and some relatives of vets who are gone actually march in the parade carrying pictures of their lost vets. So look for me out there today. I’ll be in the Viet Nam vets group (I usually try to get near the front of that group). Some vets wear their old uniforms or bits abd pieces of uniforms. I have nothing left from those days that I can still wear, so I’ll just be in civilian clothes. I’ll see you there. I went to the Ribbon Cutting ceremony held by the Huron Valley Chamber of Commerc at Le Rendez Vous Wednesday afternoon. 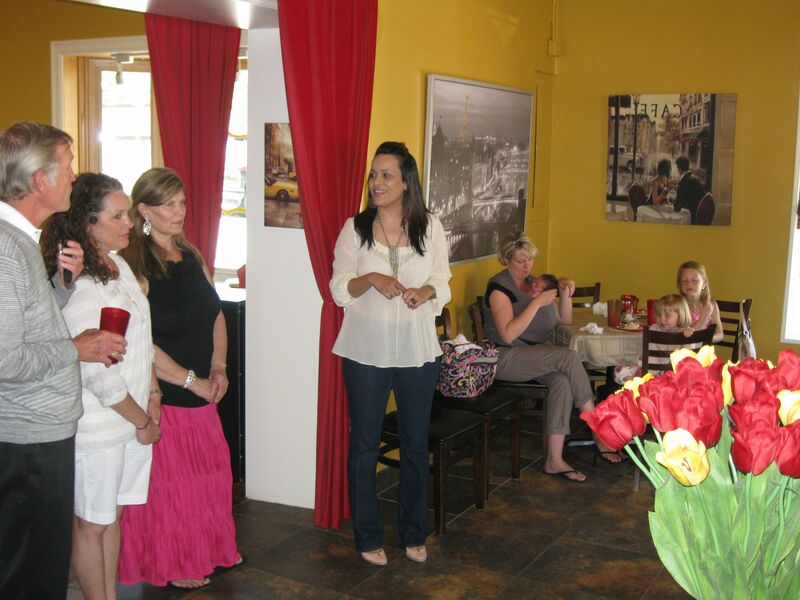 Owner Donna Rizk laid out quite a spread for the group that gathered to welcome her to the business community. Treats included roll-up slices of some of her lunch crepes, as well as dessert crepe roll-ups, cupcakes, creampuffs and delicious little petit fours. I’m sure that each delightful treat has a French name that sounds better than how just described them; but, they were all great and that’s what really counts. You really must try Le Rendez Vous for lunch or a brunch sometime. I’ll be featuring Donna and the bakery/restaurant in a future Featured Business posting. Donna is a French ex-patriot who’s been in the U.S. since about 2005. She brought her love of baking with her and had done quite a bit of customer order baking for weddings, birthdays and other special events before she decided to open her own place. Le Rendez Vous is located on the south in of the main downtown Milford area at 239 N. Main St. The building has housed a number of businesses, most recently The Sweet Life Bakery. The current set up has the bakery shop in the back of the building (accessed through a side door) and the creperie/restaurant in the front. So if you’re planning to be in Milford to do a little shopping at one of our fine downtown stores plan on stopping for lunch at Le Rendez Vous. You won’t be sorry. I’ll be you end up taking home a bag of goodies from the bakery, too. In this era of budget cuts and teacher layoffs it is tougher than ever to get funding for things that are considered non-essential – like a place for kids to play safely while on recess. 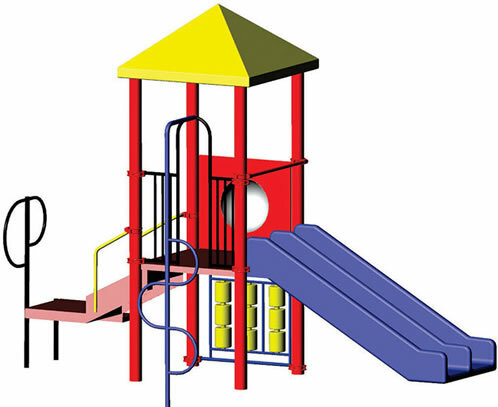 That’s why the parents and teachers in the PTA at Kurtz Elementary have taken on the project to raise money for new playground equipment to replace the old and non-code compliant equipment that is there now. The group is asking individuals and local businesses to donate and is promising to place an engraved brick into the hardscape that will pave the way to the new playground. For more information on how you can donate to this cause click here. Get your brick on the Kutz walk of fame. It may seem to some not be as worthy a cause as many other appeals that are in the news these days, but providing the necessary environment to let kids be kids while they are at this level in school is as important as any other aspect of their educational process. They’ll grown up and grow out of the need to play with abandon soon enough. For now, please help the Kurtz PTA and let the kids play. I just posted the updated sale numbers for May on my Move To Milford web site, but before you rush off to see them, let’s see how good your feel for the market in this area is. Below are a series of questions that can be answered by looking at the stats posted on the Move To Milford site. 2. Which has the higher average sale price so far in May, Commerce or West Bloomfield? 3. Which market has the higher average cost per Sq Ft, White Lake or Highland? 4. Which market currently has the shorter median days-on-market (indicating quicker sales), Milford or South Lyon? Understanding the statistics within a market area that you may be looking in or in which you may be ready to sell can help you make a better offer or help you price you home better to the market. In general the answer to the Title question for this post is that the market has flipped over to a seller’s market, with many homes receiving multiple bids and prices holding fairly firm at or in many cases above the asking price. There is every indication that the pent up demand that has been building in the market is now showing itself; however, home owners who aer still underwater on their mortgages are holding back from the market causing a shortage of inventory. We are now down to about 4 months supply locally, whereas a 6 months supply would be considered a balanced market. You are currently browsing the NormsMilfordBlog blog archives for May, 2012.